Samsung Electronics’ Galaxy S8 is facing complaints from some customers who say the display panels of their new phones have a reddish tint. The problem may be caused by the color balance of organic light-emitting diode panels, according to industry watchers. 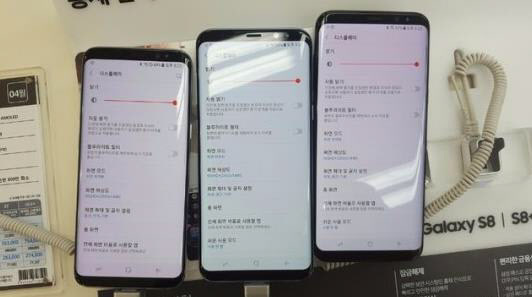 Some customers who preordered the Galaxy S8 wrote on online communities that their new phones have a reddish screen that did not improve even after correcting color display settings. However, some users still said they were not able to adjust the color because the display panel was already optimized. “The reddish tint may be caused by a color balance problem after Samsung used deep red AMOLED to strengthen the red,” said an industry watcher who declined to be identified. Unlike LCD smartphone panels using three subpixels -- red, green and blue -- the Galaxy S8’s OLED panel uses two subpixels -- red-green and blue-green. This may pose the risk of having a color balance problem because there are two greens. Therefore, Samsung developed deep red OLEDs to strengthen the color and the reddish tint might have resulted due to the new process. Apart from the reddish tint issue, Samsung’s new Galaxy S8 is facing complaints from global consumers about the use of its Bixby button being limited only to the operation of voice assistant Bixby. Bixby had drawn attention as the button on the left side of the phone is said to be capable of being compatible with Google Assistant, the camera and other apps. However, Samsung has reportedly prevented the Bixby button on its Galaxy S8 from being used to perform other functions. Some US tech media said Samsung wants to lock up Galaxy users within the Bixby system to gain an edge over Microsoft Cortana, Apple Siri and Google Assistant. Meanwhile, Samsung announced Tuesday that around 1 million units of the Galaxy S8 had been sold from April 7 to Monday.